Queens of the Stone Age frontman Josh Homme has released a statement after his recent incident with a concert photographer. Video has emerged that shows Homme walk over and intentionally kick Shutterstock photographer Chelsea Lauren’s camera, hitting her in the head. QOTSA were performing at KROQ’s Acoustic Christmas Concert in Los Angeles. While playing guitar, Homme can be seen swinging his leg in a sweeping fashion towards Lauren, and kicking her camera pretty hard, prompting the camera to swing back and strike her in the face. The result of the incident was bruising to her face and a stiff neck from whiplash. Homme could also face charges, as Lauren plans to file a police report. Josh was coming over and I was pretty excited, I’ve never actually photographed Queens Of The Stone Age before, I was really looking forward to it. I saw him coming over and I was shooting away. The next thing I know, his foot connects with my camera and my camera connects with my face, really hard. He looked straight at me, swung his leg back pretty hard and full-blown kicked me in the face. He continued performing, I was startled, I kind of stopped looking at him, I just got down and was holding my face because it hurt so badly. My neck is a sore, my eyebrow bruised and I’m a bit nauseous. Assault in any form is not okay, no matter what the reasoning. Alcohol and drugs are no excuse. I was where I was allowed to be, I was not breaking any rules. I was simply trying to do my job. I hold nobody accountable for this but Josh himself. The irony is someone had thrown an ice cube on to the very slick catwalk before the QOTSA set. I was afraid that one of the band members might slip and hurt themselves so, when the lights went dark, I used my arm to wipe down the runway so nobody would hurt themselves. Lauren went on to photograph Thirty Seconds To Mars and Muse after the incident before seeking medical treatment. 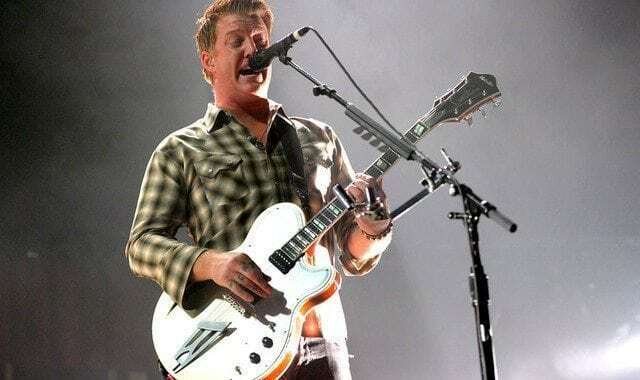 As of press time, QOTSA management has not reached out to contact the photographer about the incident.